Living on the edge of the West Coast in the U.S. brings with it many rewards, but also some conditions that can cause damage to a homes foundation. When this happens, some local residents are unsure what to do and concerned about the complexity and cost of foundation repairs. 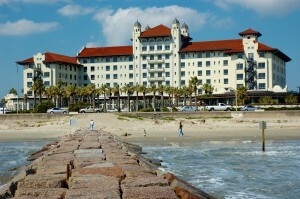 This article will look at some of the causes of damage that are specific to Galveston residents and what you should do. Tropical storms and hurricane season can be a time when tremendous amounts of water falls. As these storms can last for days and leave huge amounts of water, it can cause significant changes to the land during these times. Then other times the area is prone to droughts. When the land becomes swollen from the rain, it expands and puts pressure on your foundation. This can lead to damage. When the land becomes very dry from the periods of drought the land contracts and pulls on the foundation and this too leads to damage and breaks in our foundation. If you are worried that your land settling will cause damage, it usually does not. But if you have found some of your windows do not open and shut as they should, or some of your doors have become difficult to open and close, then these are signs that your foundation may have become out of line or have damage. If you see visible cracks and they are still less than a quarter inch in diameter, then it may be enough to fix them by filling in the cracks with epoxy. But if there are several cracks or the cracks are more than a quarter inch in diameter, then you need to get a professional to inspect your foundation to determine if it is in need of repair. It is important that you do your due diligence in finding a reputable company that will give you the facts about your foundation. This is important for two reasons. The first reason is that an estimated forty percent of inspections show that foundations are not in need of repair. This being the case, you will want to be confident that the assessment will not show unnecessary repairs. The second reason it is important to get a repair service with proven service is that some repairs are highly likely to result in plumbing issues that will need repair after the foundation services are performed. If your service company is experienced and reputable they will gladly tell you if there is a likelihood of this occurring. Some repairs just cannot be done without the chance of plumbing damage, but a reputable company will forewarn you so you can be prepare for the additional cost of repairs after your foundation is finished. It is very important that you do not delay once you find that your foundation is damaged. Even if you are not sure, but suspect there is damage, you need to call for a professional assessment. While the cost and the complications of foundation repair may intimidate you, delaying will only further complicate the issue and raise the cost of repairs.